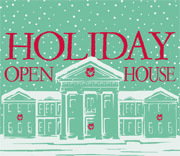 This Sunday, December 4, from 1pm to 4:30pm, the Old State House becomes the Holiday Open (Old State) House. The traditions of joyous family holiday celebrations past can be relived at Holiday Open House. Visitors will find the Old State House colorfully decorated for the season. 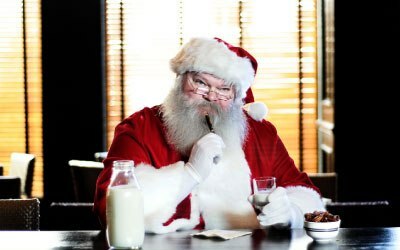 Fun, hands-on activities will be available to children; they may create unique holiday cards and more! Delightful carols will be performed by local music groups. Visitors will also enjoy delicious cookies and punch. It will also be a great time to revisit the galleries or see them for the first time. From the restored legislative chambers which tell the story of Arkansas’ leaders, to the First Ladies gowns to the exhibits: Arkansas Arkansaw-A State and Its Reputation and An Enduring Union — there is plenty to see. Call (501) 324-9685 for more information. Admission is free. The Old State House is a museum of the Department of Arkansas Heritage. 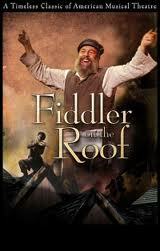 Celebrity Attractions brings the national tour of Fiddler on the Roof to Little Rock for three days. The first performance is tonight; the show continues through December 1 at Robinson Center Music Hall. The original production captured nine Tony Awards, and the show has been capturing hearts for 46 years. 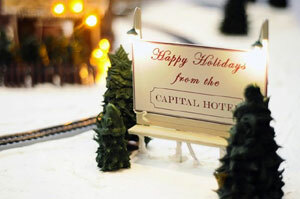 Music, design and history converge this evening when Capital Hotel hosts A Capital Christmas today. The festivities begin at 5:30pm when the UALR Flute Ensemble is in concert in the hotel lobby and the gingerbread village is officially unveiled. 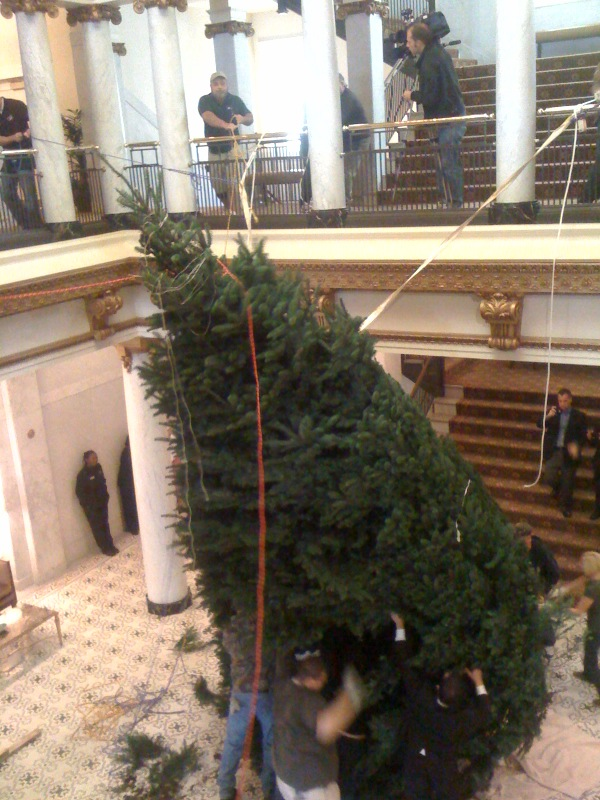 At 6:30 pm, the tree will officially be lit. Also during the evening, dancers from Ballet Arkansas’ production of The Nutcracker will be on hand. Throughout the Christmas season, there will be performances of music groups at the Capital Hotel. Today’s sculpture is passed by tens of thousands of persons each day – and they have no idea. It is Greer Farris’ 1983 sculpture Patronus which sits on the grounds of the John L. McClellan Memorial Veteran’s Hospital. Though it faces I-630, it is hidden by highway berm and construction fencing. Patronus consists of five identical forms which are placed aside each other equidistantly in a slight curve. 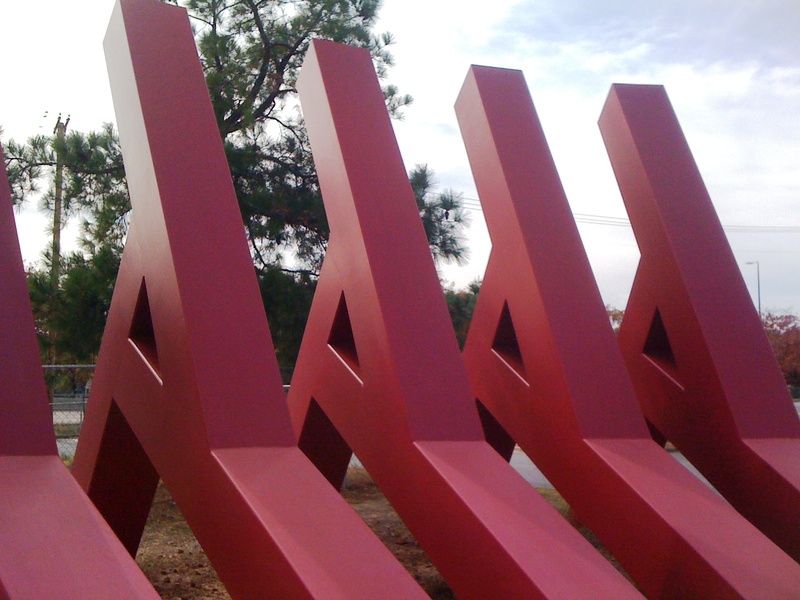 It was fabricated at the Arkansas Valley Steel Company and each section was trucked down separately on the back of a flatbed truck. The simplicity of the design and the clean lines make this a powerful piece of abstract art. Its design was inspired by battlements used in World War I, very appropriate for a veteran’s hospital. 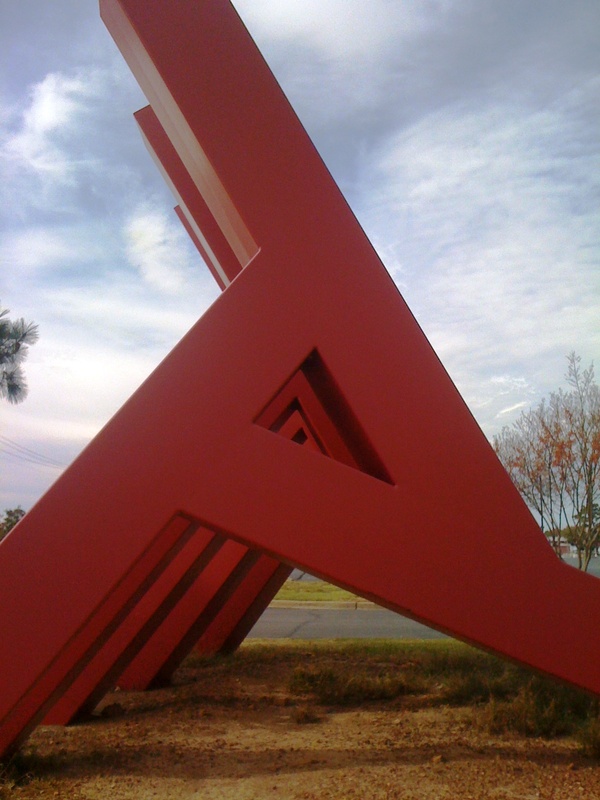 It was installed in 1984. Since then, there has rarely been a time when the VA and/or UAMS or some other nearby entity has not been in construction mode. 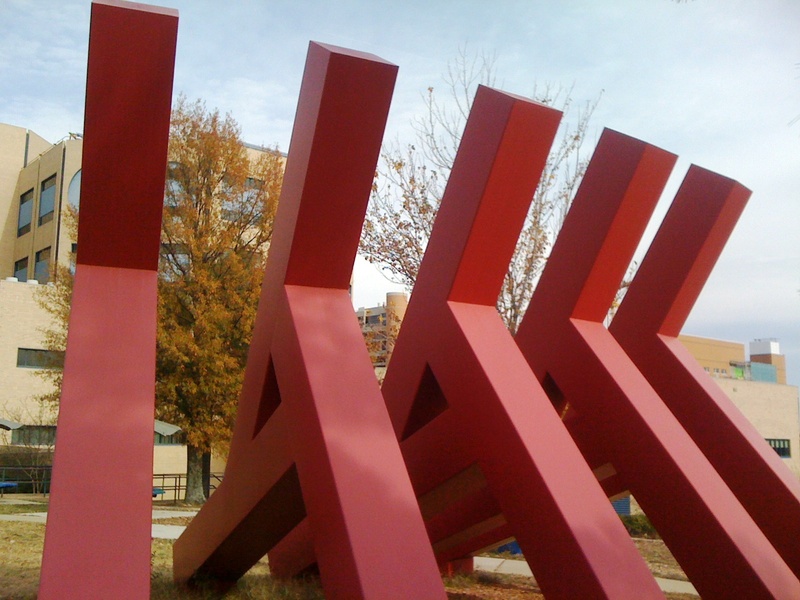 The sculpture was never on a huge plot of land (which would have been more appropriate given its scale) but is now reduced to a small peninsula next to a few picnic tables in the parking lot. CALS is a Library Star! The Central Arkansas Library System (CALS) has been listed as a Star Library in the Library Journal Index of Public Library Service. The index measures the service levels of the nation’s 7,153 public libraries, based on circulation, visits, Internet use, and program attendance. CALS, with a total score of 773, was one of only twenty Southern libraries to receive the Star recognition. Rankings were based on 2009 data released by the Institute of Museum and Library Services in July, 2011. CALS is listed twenty-fifth out of 107 libraries that fall within an expenditure range of $10 million to $29.9 million. 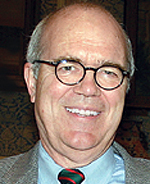 In 2009 CALS’s budget was $13,750,000. Since opening as the Little Rock Public Library in 1910, CALS has added branches and services, evolving to meet the needs of patrons and becoming one of the largest systems in the mid-South. Innovations such as the bookmobile service that began in 1938 gave way to branch libraries, interlibrary loan, and online access to information. Though many libraries are seeing reduction in funding, circulation and attendance, CALS has had twelve years of increases in circulation and attendance, and because funding sources are tied to property taxes, has not had to reduce service or staff. The Main Library campus offers an extensive Reference department, computer lab, specialized Arkansas research resources, art galleries, a used book store, two cafés, and a new area specially designed to accommodate the needs and interests of teens. McMath Library, 2100 John Barrow Road. CALS also has branches in Jacksonville, Maumelle, Perryville and Sherwood. As the holiday season approaches, red and green are not the only colors en vogue. Black and white is always a classic. 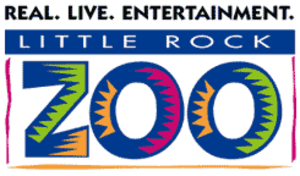 Tomorrow the Little Rock Zoo continues its breakfast series with Breakfast with the Penguins. Seating is limited and prior reservations are required: call 661-7218. The breakfast starts at 8am sharp. Prices range from $12.95 for a member child up to $21.95 for a non-member adult. Earlier this year, the Little Rock Zoo formally opened the Laura P. Nichols Penguin Pointe exhibit with eleven penguins: Blair, Billi, Mary Beth, Roy, Jack, Domino, Rippley, Gable, Brenton, Laura and Skipper. The African blackfooted penguins came from other zoos as part of the Species Survival Plan (SSP). These penguins are on the endangered species list, but through SSP, the Zoo will fulfill its mission of conservation. Any baby penguins born will be donated to other zoos. Over $2.3 million was raised through private and public sources to build the unique exhibit. On this day of giving thanks and expressing appreciation, the entry focuses on The THEA Foundation, which gives so much throughout the state. The mission of the THEA Foundation is to advocate the importance of the arts in the development of our youth. 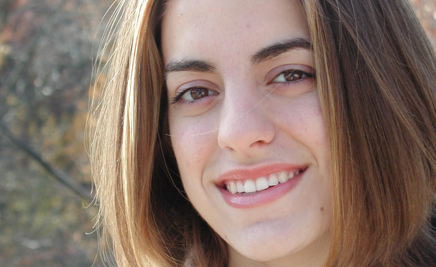 The THEA Foundation is was founded in 2001 by Paul and Linda Leopoulos, parents of Thea Leopoulos, who was tragically killed in her junior year of high school. Thea had blossomed after discovering her artistic gifts in painting, writing, dance, speech, and drama. The THEA Foundation was created soon after Thea’s untimely death as a way to provide other young people the opportunity to find their confidence through involvement in the arts. Thea’s interest in the arts required hard work, focus, and concentration, and she accomplished wonderful things. The harder she worked the better and more satisfying the results. It was exciting to watch her evolve into a whole person who believed she could challenge herself in any area of study. Programs of the Foundation are designed to provide opportunities for student involvement in the arts. Research into the implementation and results of successful arts-infused programs in schools around the country have led us to become an advocate for improving our schools curriculum through arts administration. This advocacy points to a better curriculum delivery process that motivates all students. When students are engaged and having fun learning, test scores rise, discipline problems diminish, and schools become a place for growth for all students. The THEA Foundation sponsors scholarships in visual and performing arts, as well as filmmaking. In addition, the THEA Foundation sponsors workshops, the Art Closet (which provides supplies for art teachers to use in classroom instruction), and Art Across Arkansas – in partnership with the William J. Clinton Foundation. The THEA Foundation’s advocacy is based on schools that have successfully motivated and engaged students through an arts-infused delivery system of instruction for the curriculum. An arts-infused delivery system means teaching math, science, social studies, history, spelling, writing, speech, and literature using art, drama, music, and rhyme to enhance the learning process. The THEA Foundation reaches all corners of the state. 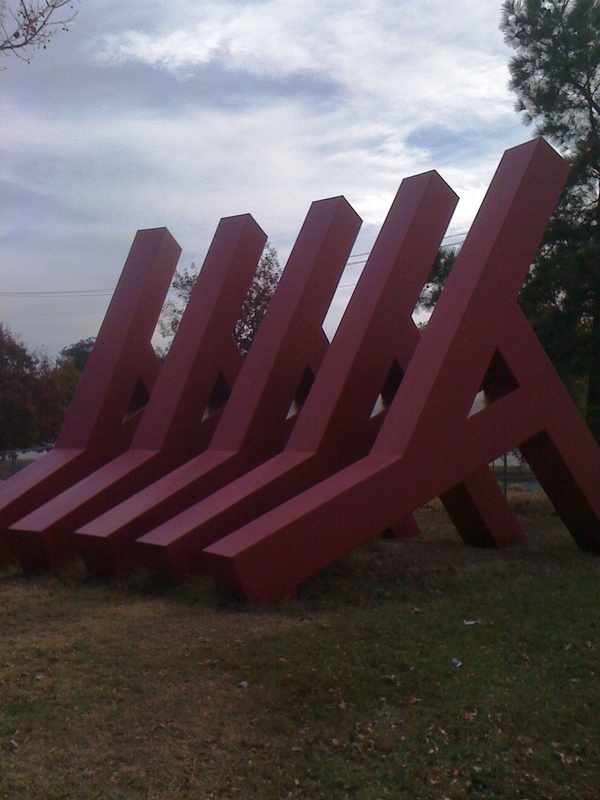 This work emanates from the THEA Foundation Center for the Arts on Main Street in North Little Rock. Dedicated in 2008, it features the Judy Kohn Tenenbaum Gallery.